(Bloomberg) -- South Korean President Moon Jae-in said it’s time to prepare for talks with North Korean leader Kim Jong Un, commenting just days after returning from a visit to the White House where he tried to get faltering nuclear negotiations back on track. Moon, who has tried to be a bridge between Kim and President Donald Trump, said Monday North Korea’s leader is committed to denuclearization and the U.S. president feels a top-down peace process is necessary for the divided peninsula. Kim and Trump’s February summit collapsed without a deal, with both sides blaming the other for the breakdown. Moon was also battered when Kim said in a speech last week before the country’s Supreme People’s Assembly that South Korea should “not pose as a meddlesome mediator.” He criticized Moon’s government for standing with the U.S. in enforcing sanctions crippling North Korea’s economy and holding joint military drills with the U.S., according to North Korea’s state-run media. Kim called on the U.S. to offer acceptable terms for an agreement by the end of the year, remarks that suggested an attempt to breathe new life into the stalled negotiations. South Korea’s Moon said on Monday that Kim showed his commitment for continuing dialogue during his speech at the Supreme People’s Assembly. Separately, South Korea’s defense ministry defended joint drills that Kim criticized during the speech, saying that holding the drills didn’t go against the military agreement reached last September by Kim and Moon at their summit in Pyongyang. 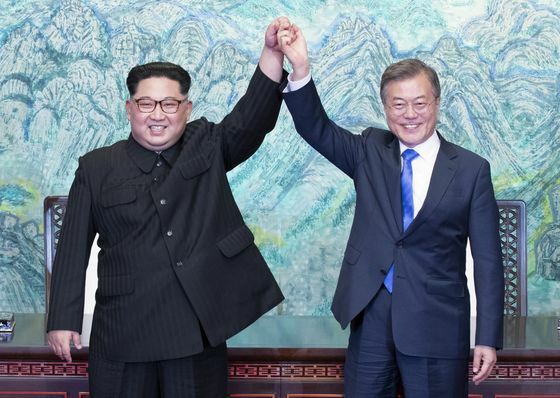 In Pyongyang, Kim and Moon agreed on a range of measures to bolster Korean relations, including connecting railways, reuniting families, preparing to restart economic projects and withdrawing guard posts from their heavily militarized border.